A two-component, primer sealer designed to create a uniform surface for all topcoats, except lacquers. This urethane sealer can be used as a non-sanding, single-coat sealer over body work, primer surfacer and existing finishes. It can also be used as an barrier coat over problem areas or substrates. RS-776 has excellent solvent resistance and color holdout. 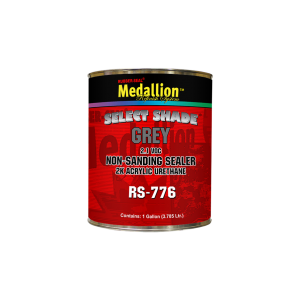 As part of the Select Shade® system, it can be intermixed to with RS-776W (white) or RS-776B (black) to achieve various shades of grey. RS-776 can also be tinted up to 5% with toner or primer tints to improve topcoat hiding. It is compliant in North America. Available in quarts and gallons.